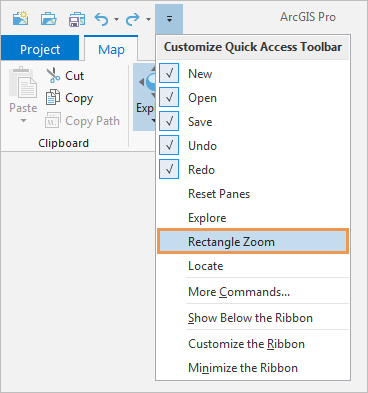 The Quick Access Toolbar, located above the ribbon, provides easy access to common commands. By default, it has five commands: New Project , Open Project , Save Project , Undo , and Redo . 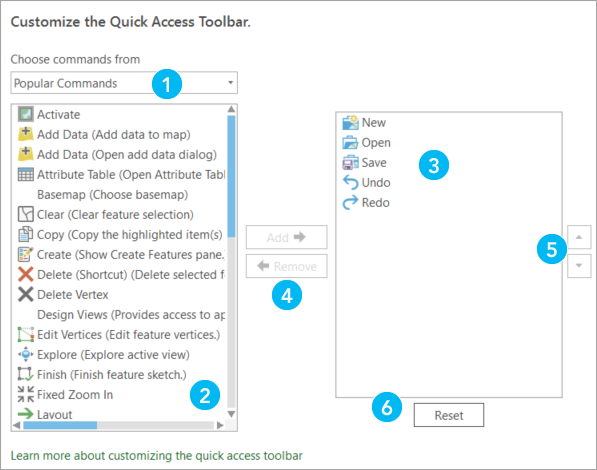 You can customize the Quick Access Toolbar in several ways. You can use the Customize Quick Access Toolbar button , located on the toolbar, to add or remove commands. You can also add a command to the toolbar by right-clicking the command on the ribbon. Finally, you can use the Quick Access Toolbar options to add, remove, or reorder commands. You can add commands from a preset list with the Customize Quick Access Toolbar button. You can also remove commands, move the Quick Access Toolbar, minimize the ribbon, and access customization options. In an open project, on the Quick Access Toolbar, click the Customize Quick Access Toolbar button . On the drop-down list, click a command with no check mark to add it to the Quick Access Toolbar. In this example, the Rectangle Zoom command is added. The command is added to the right of the other commands on the toolbar. To remove a command, click the Customize Quick Access Toolbar button and uncheck the command. Alternatively, right-click the command on the Quick Access Toolbar and click Remove from Quick Access Toolbar. You can add commands from the ribbon to the Quick Access Toolbar. In an open project, on the ribbon, right-click a command and click Add to Quick Access Toolbar. 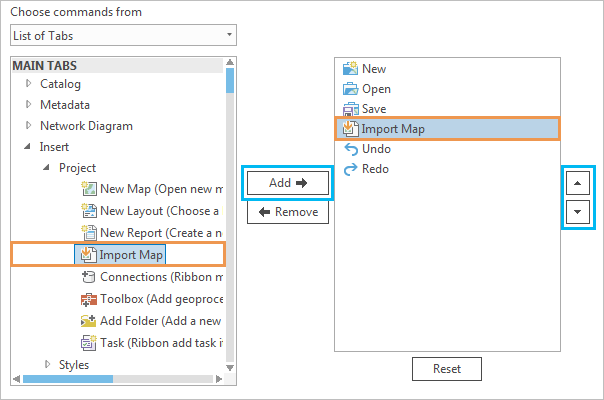 In this example, the New Map command on the Insert tab is added. You can use the Quick Access Toolbar options to add or remove commands, reorder commands, or reset the toolbar to its default state. On the Options dialog box menu, under Application, click Quick Access Toolbar. 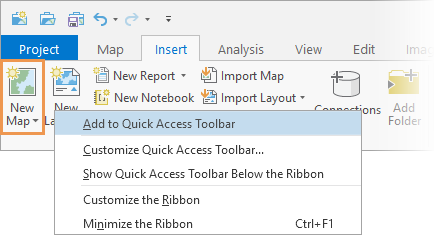 You can also open the Quick Access Toolbar options from the Customize Quick Access Toolbar button or by right-clicking a command on the ribbon. The Choose commands from drop-down list. Commands that you want to add to the Quick Access Toolbar can be selected from their current locations on the ribbon (List of Tabs) or from an alphabetical list (All Commands). Geoprocessing tools are found on their own list (Geoprocessing Tools). By default, commands are presented in the left-hand window in the List of Tabs format. Expand the tabs and groups on which a command is found and select the command. The current configuration of the Quick Access Toolbar is presented in the right-hand window. This is where new commands are added. Reset button to restore the default Quick Access Toolbar configuration. If you choose All Commands or Geoprocessing Tools, a search box becomes available. Optionally, select the command in the window on the right and use the arrow keys next to the window to move the command. Return to your project or open a project. The command appears on the Quick Access Toolbar. Click Reset to restore the Quick Access Toolbar to its default state.